Zionism is a political movement that supports a homeland for the Jewish people in the Land of Israel, where Jewish nationhood is thought to have evolved somewhere between 1200 BCE and late Second Temple times, and where Jewish kingdoms existed up to the 2nd century CE. Zionism is defined as "an international movement originally for the establishment of a Jewish national or religious community in Palestine and later for the support of modern Israel." It has been described as a diaspora nationalism. Its proponents regard it as a national liberation movement whose aim is the self-determination of the Jewish people. While Zionism is based in part upon religious tradition linking the Jewish people to the Land of Israel, the modern movement was mainly secular, beginning largely as a response to rampant antisemitism in Europe during the 19th century. At first one of several Jewish political movements offering alternative responses to the position of Jews in Europe, Zionism gradually gained more support. The Holocaust accelerated Jewish immigration to the Land of Israel and ultimate creation of the State of Israel. On May 14, 1948, the Declaration of the Establishment of the State of Israel stated: "In the year 5657 (1897), at the summons of the spiritual father of the Jewish State, Theodore Herzl, the First Zionist Congress convened and proclaimed the right of the Jewish people to national rebirth in its own country." The word "Zionism" itself derived from the word " Zion" (Hebrew: ציון, Tziyyon), one of the names of Jerusalem, as mentioned in the Bible. It was coined as a term for Jewish nationalism by Austrian Jewish publisher Nathan Birnbaum in his journal Self Emancipation in 1890. Since the founding of the State of Israel, the term "Zionism" is generally considered to mean support for Israel as a Jewish nation state. However, a variety of different, and sometimes competing, ideologies that support Israel fit under the general category of Zionism, such as Religious Zionism, Revisionist Zionism, and Labor Zionism. Thus, the term is also sometimes used to refer specifically to the programs of these ideologies, such as efforts to encourage Jewish emigration to Israel. The term Zionism is also sometimes used retroactively to describe the millennia-old Biblical connection between the Jewish people and the Land of Israel, which existed long before the birth of the modern Zionist movement. "... behind the cover of "anti-Zionism" lurks a variety of motives that ought to be called by their true name. When, in the 1950s under Stalin, the Jews of the Soviet Union came under severe attack and scores were executed, it was under the banner of anti-Zionism rather than anti-Semitism, which had been given a bad name by Adolf Hitler. When in later years the policy of Israeli governments was attacked as racist or colonialist in various parts of the world, the basis of the criticism was quite often the belief that Israel had no right to exist in the first place, not opposition to specific policies of the Israeli government. Traditional anti-Semitism has gone out of fashion in the West except on the extreme right. But something we might call post-anti-Semitism has taken its place. It is less violent in its aims, but still very real. By and large it has not been too difficult to differentiate between genuine and bogus anti-Zionism. The test is twofold. It is almost always clear whether the attacks are directed against a specific policy carried out by an Israeli government (for instance, as an occupying power) or against the existence of Israel. Secondly, there is the test of selectivity. If from all the evils besetting the world, the misdeeds, real or imaginary, of Zionism are singled out and given constant and relentless publicity, it can be taken for granted that the true motive is not anti-Zionism but something different and more sweeping." Zionism should be distinguished from Territorialism which was a Jewish nationalist movement calling for a Jewish homeland, but not necessarily in Palestine. During the early history of Zionism, a number of proposals were made for settling Jews outside of Europe but these all ultimately were rejected or failed. The debate over these proposals helped define the nature and focus of the Zionist movement. The desire of Jews to return to their ancestral homeland has remained a universal Jewish theme since the defeat of the Great Jewish Revolt, and the destruction of Jerusalem by the Roman Empire in the year 70, the later defeat of Bar Kokhba's revolt in 135, and the dispersal of the Jews to other parts of the Empire that followed. (During the Hellenistic Age many Jews had decided to leave Palestine to live in other parts of the Mediterranean basin by their own free will; famous figures associated with these migrations include, for example, Philo of Alexandria). Due to the disastrous results of the revolt, what had been a human-driven movement to regain national sovereignty based on religious inspiration, became, after centuries of broken hopes associated with one "false messiah" after another, a movement in which much of the human element of messianic deliverance had been replaced by a trust in Divine providence. Although Jewish nationalism in ancient times had always had religious connotations—from the Maccabean Revolt to the various Jewish revolts during Roman rule, and even during the Medieval period when intermittently national hopes were incarnated in the " false messianism" of Shabbatai Zvi,—it was not until the rise of ideological and political Zionism and its renewed belief in human-based action toward Jewish national aspirations that the notion of returning to the homeland once again became widespread among the Jewish people. Jews lived continuously in the Land of Israel even after the Bar Kokhba's revolt, and indeed there is much historical evidence of vibrant communities there continually throughout the past two millennia. For example, the Jerusalem Talmud was created in the centuries following that revolt. The inventor of Hebrew vowel-signs in the 5th century lived in a Jewish community in Palestine; and so forth. The slow and gradual decline of the Palestinian Jews occurred across a period of several centuries, and can be attributed to Hadrian's crushing of Bar Kokhba's revolt, the Arab conquest of Palestine in the 600s, the Crusader wars in the 11th century and beyond, and the inefficiencies of the Ottoman Empire from the 15th century on, by which time the land had greatly decreased in fertility and its economy was virtually nil. Despite this decline, several proto-Zionist movements over the centuries saw the revival of particular Jewish communities, such as the medieval community of Safed, the population of which was bolstered by Jews fleeing Christian persecution following the Reconquista of Al-Andalus (the Muslim name of the Iberian peninsula). In Portugal during this period, Jews were expelled by Manuel I or forced to convert to Christianity, — a policy that created the Marrano Jews, from which Spinoza came. According to chronicler Jerónimo Osório, this followed the enslavement and partial expulsion of Jewish refugees from Spain during the reign of John II. The persecution of those with Jewish blood, no matter what faith, continued in Portugal untill well into the eighteenth century. In 1536, John III established the Portuguese Inquisition, mirroring the more famous Spanish Inquisition, which imposed the limpieza de sangre doctrine, breaking away with the Caliph of Córdoba's tolerance. Return to the Land of Israel had remained a recurring theme among generations of diaspora Jews, particularly in Passover and Yom Kippur prayers which traditionally concluded with, "Next year in Jerusalem", and in the thrice-daily Amidah (Standing prayer). Aliyah (immigration to Israel) has always been considered to be a praiseworthy act for Jews according to Jewish law, and is included as a commandment in most versions of the 613 commandments. Although not found in the version of Maimonides, his other writings indicate that he considered return to the Land of Israel a matter of extreme importance for Jews. From the Middle Ages and onwards, a number of famous Jews (and often their followers) immigrated to the Land of Israel. These included Nahmanides, Yechiel of Paris with several hundred of his students, Yosef Karo, Menachem Mendel of Vitebsk and 300 of his followers, and over 500 disciples (and their families) of the Vilna Gaon known as Perushim, among others. 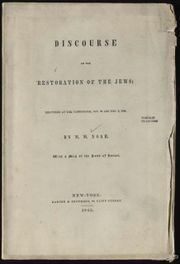 The Haskala of Jews in European countries in the 18th and 19th centuries following the French Revolution, and the spread of western liberal ideas among a section of newly emancipated Jews, created for the first time a class of secular Jews who absorbed the prevailing ideas of rationalism, romanticism and, most importantly, nationalism. Jews who had abandoned Judaism, at least in its traditional forms, began to develop a new Jewish identity, as a "nation" in the European sense. They were inspired by various national struggles, such as those for German and Italian unification, and for Polish and Hungarian independence. If Italians and Poles were entitled to a homeland, they asked, why were Jews not so entitled? A precursor to the Zionist movement of the later 1800s occurred with the 1820 attempt by journalist, playwright and American-born diplomat Mordecai Manuel Noah to establish a Jewish homeland on Grand Island, New York, (north of Buffalo, New York, USA). In 1840s, Noah advocated the "Restoration of the Jews" in the Land of Israel. Before the 1890s there had already been attempts to settle Jews in Palestine, which was in the 19th century a part of the Ottoman Empire, inhabited (in 1890) by about 520,000 people, mostly Muslims and Christian Arabs—but including 20-25,000 Jews. Pogroms in the Russian Empire led Jewish philanthropists such as the Montefiores and the Rothschilds to sponsor agricultural settlements for Russian Jews in Palestine in the late 1870s, culminating in a small group of immigrants from Russia arriving in the country in 1882. This has become known in Zionist history as the First Aliyah. Aliyah is a Hebrew word meaning "ascent," referring to the act of spiritually "ascending" to the Holy Land. While Zionism is based heavily upon Jewish religious tradition linking the Jewish people to the Land of Israel, the modern movement was mainly secular, beginning largely as a response to rampant anti-Semitism in late 19th century Europe. Moses Hess's 1862 work Rome and Jerusalem; The Last National Question argued for the Jews to settle in Palestine as a means of settling the national question. Hess proposed a socialist state in which the Jews would become agrarianised through a process of "redemption of the soil" that would transform the Jewish community into a true nation in that Jews would occupy the productive layers of society rather than being an intermediary non-productive merchant class, which is how he perceived European Jews. Hess, along with later thinkers such as Nahum Syrkin and Ber Borochov, is considered a founder of Socialist Zionism and Labour Zionism and one of the intellectual forebears of the kibbutz movement. In the same year 1862, German Orthodox Rabbi Zvi Hirsch Kalischer published his tractate Derishat Zion, positing that the salvation of the Jews, promised by the Prophets, can come about only by self-help. His ideas contributed to the Religious Zionism movement. Early Zionist groups such as Hibbat Zion were active in the 1880s in the Eastern Europe where emancipation had not occurred to the extent it did in Western Europe (or at all). The massive anti-Jewish pogroms following the assassination of Tsar Alexander II made emancipation seem more elusive than ever, and influenced Judah Leib Pinsker to publish the pamphlet Auto-Emancipation in 1882. In 1890, the "Society for the Support of Jewish Farmers and Artisans in Syria and Eretz Israel" (better known as the Odessa Committee) was officially registered as a charitable organization in the Russian Empire and by 1897 it counted over 4,000 members. American Protestant Christian Zionists such as William Eugene Blackstone also pursued the Zionist ideal during late 19th century, especially in the American Blackstone Memorial (1891). A key event said to trigger the modern Zionist movement was the Dreyfus Affair, which erupted in France in 1894. Jews were profoundly shocked to see this outbreak of anti-Semitism in a country which they thought of as the home of enlightenment and liberty. Among those who witnessed the Affair was an Austro-Hungarian (born in Budapest, lived in Vienna) Jewish journalist, Theodor Herzl, who published his pamphlet Der Judenstaat ("The Jewish State") in 1896 and described the Affair as a turning point—prior to the Affair, Herzl had been anti-Zionist, afterwards he became ardently pro-Zionist. 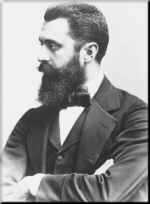 In 1897 Herzl organised the First Zionist Congress in Basel, Switzerland, which founded the World Zionist Organisation (WZO) and elected Herzl as its first President. Founded in 1878, Petah Tikva was the first Zionist settlement. It was inhabited by former residents of Jerusalem hoping to escape the cramped quarters of Jerusalem's Old City walls. Rishon LeZion was founded on 31 July 1882 by a group of ten members of the Zionist group Hovevei Zion from Kharkov (today's Ukraine). Led by Zalman David Levontin, they purchased 835 acres (3.4 km²) of land for this purpose near an Arab village named Uyun Qara. The land was owned by Tzvi Leventine and was purchased by the "Pioneers of Jewish Settlement Committee" that was formed in Jaffa, the port of arrival for many of the immigrants to the area. In 1883, Nathan Birnbaum, nineteen years old, founded Kadimah, the first Jewish Students Association in Vienna. 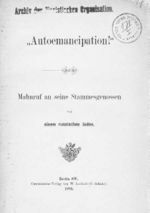 In 1884 the first issue of Selbstemanzipation or Self Emancipation appeared, completely made by Nathan Birnbaum himself. Theodor Herzl addresses the Second Zionist Congress in 1898. The promotion by appropriate means of the settlement in Eretz-Israel of Jewish farmers, artisans, and manufacturers. The organization and uniting of the whole of Jewry by means of appropriate institutions, both local and international, in accordance with the laws of each country. The strengthening and fostering of Jewish national sentiment and national consciousness. Preparatory steps toward obtaining the consent of governments, where necessary, in order to reach the goals of Zionism. After the First Zionist Congress, the World Zionist Organization met every year first four years, later they gathered every second year till the Second World War. After the war the Congress met every four years until present time. The WZO's initial strategy was to obtain permission of the Ottoman Sultan Abd-ul-Hamid II to allow systematic Jewish settlement in Palestine. The good offices of the German Emperor, Wilhelm II, were sought, but nothing came of this. Instead, the WZO pursued a strategy of building a homeland through persistent small-scale immigration, and the founding of such bodies as the Jewish National Fund in 1901 and the Anglo-Palestine Bank in 1903. Before 1917 some Zionist leaders took seriously proposals for Jewish homelands in places other than Palestine. Herzl's Der Judenstaat argued for a Jewish state in either Palestine, "our ever-memorable historic home", or Argentina, "one of the most fertile countries in the world". In 1903 British cabinet ministers suggested the British Uganda Program, land for a Jewish state in "Uganda" (in today's Kenya). Herzl initially rejected the idea, preferring Palestine, but after the April 1903 Kishinev pogrom Herzl introduced a controversial proposal to the Sixth Zionist Congress to investigate the offer as a temporary measure for Russian Jews in danger. Notwithstanding its emergency and temporary nature, the proposal still proved very divisive, and widespread opposition to the plan was fueled by a walkout led by the Russian Jewish delegation to the Congress. 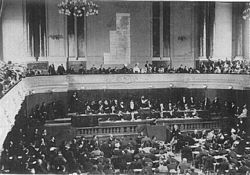 Nevertheless, a majority voted to establish a committee for the investigation of the possibility, and it was not dismissed until the 7th Zionist Congress in 1905. In response to this, the Jewish Territorialist Organization (ITO) led by Israel Zangwill split off from the main Zionist movement. The territorialists attempted to establish a Jewish homeland wherever possible, but went into decline after 1917 and the ITO was dissolved in 1925. From that time Palestine was the sole focus of Zionist aspirations. In 1928, the Soviet Union established a Jewish Autonomous Oblast in the Russian Far East but the effort failed to meet expectations and as of 2002 Jews constitute only about 1.2% of its population. One of the major motivations for Zionism was the belief that the Jews needed to return to their historic homeland, not just as a refuge from anti-Semitism, but also to govern themselves as an independent nation. Some Zionists, mainly socialist Zionists, believed that the Jews' centuries of being oppressed in anti-Semitic societies had reduced Jews to a meek, vulnerable, despairing existence which invited further anti-Semitism. They argued that Jews should redeem themselves from their history by becoming farmers, workers, and soldiers in a country of their own. These socialist Zionists generally rejected religion as perpetuating a " Diaspora mentality" among the Jewish people. One such Zionist ideologue, Ber Borochov, continuing from the work of Moses Hess, proposed the creation of a socialist society that would correct the "inverted pyramid" of Jewish society. Borochov believed that Jews were forced out of normal occupations by Gentile hostility and competition, using this dynamic to explain the relative predominance of Jewish professionals, rather than workers. Jewish society, he argued, would not be healthy until the inverted pyramid was righted, and the majority of Jews became workers and peasants again. This, he held, could only be accomplished by Jews in their own country. Another Zionist thinker, A. D. Gordon, was influenced by the völkisch ideas of European romantic nationalism, and proposed establishing a society of Jewish peasants. Gordon made a religion of work. These two figures, and others like them, motivated the establishment of the first Jewish collective settlement, or kibbutz, Degania, on the southern shore of the Sea of Galilee, in 1909 (the same year that the city of Tel Aviv was established). Deganiah, and many other kibbutzim that were soon to follow, attempted to realise these thinkers' vision by creating a communal villages, where newly arrived European Jews would be taught agriculture and other manual skills. Tel Aviv, its name taken from a work by Theodor Herzl, was founded by Zionists on empty dunes north of Jaffa. This photograph is of the auction of the first lots in 1909. The development of the first modern Hebrew-speaking city (Tel Aviv), the kibbutz movement, and other Jewish economic institutions, plus the use of Hebrew, began by the 1920s to lay the foundations of a new nationality, which would come into formal existence in 1948. Meanwhile, other cultural Zionists attempted to create new Jewish artforms, including graphic arts. ( Boris Schatz, a Bulgarian artist, founded the Bezalel Academy of Arts and Design in Jerusalem in 1906.) Others, such as dancer and artist Baruch Agadati, fostered popular festivals such as the Adloyada carnival on Purim. At the urging of Lord Shaftesbury, Britain established a consulate in Jerusalem in 1838, the first diplomatic appointment in the Land of Israel. In 1839, the Church of Scotland sent Andrew Bonar and Robert Murray M'Cheyne to report on the condition of the Jews in their land. Their report was widely published and was followed by a "Memorandum to Protestant Monarchs of Europe for the restoration of the Jews to Palestine." In August 1840, The Times reported that the British government was considering Jewish restoration. Lord Lindsay wrote in 1847: "The soil of Palestine still enjoys her sabbaths, and only waits for the return of her banished children, and the application of industry, commensurate with her agricultural capabilities, to burst once more into universal luxuriance, and be all that she ever was in the days of Solomon." The Treaty of Paris (1856) granted Jews and Christians the right to settle in Palestine and opened the doors for Jewish immigration. In her 1876 novel Daniel Deronda, George Eliot advocated "the restoration of a Jewish state planted in the old ground as a centre of a national feeling, a source of dignifying protection, a special channel for special energies and an added voice in the councils of the world." Benjamin Disraeli wrote in his article entitled "The Jewish Question is the Oriental Quest" (1877) that within fifty years a nation of one million Jews would reside in Palestine under the guidance of the British. Moses Montefiore visited the Land of Israel seven times and fostered its development. Capitulations of the Ottoman Empire allowed the British place missions in the region and to institute charitable projects such as hospitals, settlement colonies and exploratory surveys and by the end of the 19th century, British interest in the Middle East increased because it was considered essential to guard the route to India. The Zionist leaders always saw Britain as a key potential ally in the struggle for a Jewish homeland. Not only was Britain the world's greatest imperial power; it was also a country where Jews had lived for centuries in relative peace and security — among them influential political and cultural leaders such as Disraeli, Montefiore and Lord Rothschild. Chaim Weizmann's invention of cordite was critical for the Allies of World War I. In his meetings with the British Prime Minister Lloyd George and the First Lord of the Admiralty Winston Churchill, Weizmann, the leader of the Zionist movement since 1904, was able to advance the Zionist cause for which the war had created new prospects. This hope was realised in 1917, when the British Foreign Secretary, Arthur Balfour, made his famous Declaration in favour of "the establishment in Palestine of a national home for the Jewish people". The Declaration used the word "home" rather than "state," and specified that its establishment must not "prejudice the civil and religious rights of existing non-Jewish communities in Palestine." 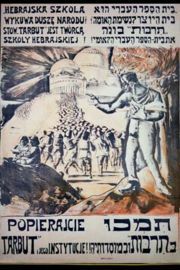 Poster from the Zionist Tarbut schools of Poland in the 1930s. Zionist parties were very active in Polish politics. In the 1922 Polish elections, Zionists held 24 seats of a total of 35 Jewish parliament members. The chain of events between 1881 and 1945, beginning with waves of anti-Semitic pogroms in Russia and the Russian-controlled areas of Poland, and culminating in the Holocaust, converted the great majority of surviving Jews to the belief that a Jewish homeland was an urgent necessity, particularly given the large population of disenfranchised Jewish refugees after World War II. Most also became convinced that the Land of Israel was the only location that was both acceptable to all strands of Jewish thought and within the realms of practical possibility. This led to the great majority of Jews supporting the struggle between 1945 and 1948 to establish the State of Israel, though many did not condone violent tactics used by some Zionist groups. Initially, support for political Zionism was not a mainstream position in the Jewish communities scattered around the world. The secular, socialist language used by many pioneer Zionists was contrary to the outlook of most religious Jewish communities, and many religious organisations opposed it, both on the grounds that it was a secular movement, and on the grounds that any attempt to re-establish Jewish rule in Israel by human agency was blasphemous, since (in their view) only the Messiah could accomplish this. While traditional Jewish belief held that the Land of Israel was given to the ancient Israelites by God, and that therefore the right of the Jews to that land was permanent and inalienable, most Orthodox groups held that the Messiah must appear before Israel could return to Jewish control. Prior to the Holocaust, Reform Judaism explicitly rejected Zionism. When the Balfour Declaration was issued in 1917, Edwin Montagu, the only Jew in the British Cabinet, "was passionately opposed to the declaration on the grounds that (a) it was a capitulation to anti-Semitic bigotry, with its suggestion that Palestine was the natural destination of the Jews, and that (b) it would be a grave cause of alarm to the Muslim world." Haredi Jewish opinion was overwhelmingly negative, with several Hasidic groups calling Zionists the personification of Satan, blaming Zionism for the Holocaust, accusing them of being the source of all evil in the world and defiling the entire world with their impurity. The 1911 edition of the Jewish Encyclopedia evidenced the movement's growing popularity: "there is hardly a nook or corner of the Jewish world in which Zionistic societies are not to be found." In the 1920s and 1930s, a small but vocal group of religious Jews began to develop the concept of Religious Zionism under such leaders as Rabbi Abraham Isaac Kook (the Chief Rabbi of Palestine) and his son Zevi Judah, and gained substantial following during the latter half of the 20th century. Only the desperate circumstances of the 1930s and 1940s converted most (though not all) of these communities to Zionism. By 1940, there were 171,000 members of Zionist organizations, and by 1942, 80% of American Jews surveyed agreed that a homeland in Palestine was required. The Jews who already lived in the region of Palestine had a long and complex history of interaction with their Muslim neighbours and rulers, which was complicated by the relationship between Islam and Judaism. Outside of Jerusalem, Safed, and Tiberias, Arabs and/or Muslims constituted the overwhelming majority of the population. The early Zionists were well aware of this, but claimed that the inhabitants could only benefit from Jewish immigration. They also were inclined to settle in uninhabited areas, such as the coastal plain and the Jezreel Valley, thus avoiding conflict with the Arabs. Within Zionist literature, the Arab presence was largely ignored, as in the famous slogan "A land without a people for a people without a land." This slogan is often attributed to Israel Zangwill, but its original form, "A country without a nation for a nation without a country," was penned by Lord Shaftesbury. Generally such statements were propaganda invented by leaders who did not foresee the subsequent conflict with the Arabs and thought of them as allies against the big empires whom they viewed as the main obstacle. Agreements with the Ottoman authorities, or with Arab rulers outside Palestine were their main concern and concerns of the local Arabs were overlooked. Though there had already been Arab protests to the Ottoman authorities in the 1880s against land sales to foreign Jews, the most serious opposition began in the 1890s after the full scope of the Zionist enterprise became known. This opposition did not arise out of Palestinian nationalism, which was in its infancy at the time, but out of a sense of threat to the livelihood of the Arabs. This sense was heightened in the early years of the 20th century by the Zionist attempts to develop an economy in which Arabs were largely redundant, such as the "Hebrew labor" movement that campaigned against the employment of Arabs. The severing of Palestine from the rest of the Arab world in 1918 and the Balfour Declaration were seen by the Arabs as proof that their fears were coming to fruition. The situation with socialist Zionists such as David Ben-Gurion was also ambiguous. In public Ben-Gurion upheld the official position of his party that denied the necessity of force in achieving Zionist goals. The argument was based on the denial of a unique Palestinian identity coupled with the belief that eventually the Arabs would realise that Zionism was to their advantage. The British plan was soon shelved, but the idea of a Jewish state with a minimal population of Arabs remained an important thread in Labour Zionist thought throughout the remaining period until the creation of Israel. The attitude of the Zionist leaders towards the Arab population of Palestine in the lead-up to the 1948 conflict is one of the most hotly debated issues in Zionist history. This article does not cover it; see 1936-1939 Arab revolt in Palestine, Israel-Palestinian conflict, and the Palestinian exodus for more information on this. With the defeat and dismantling of the Ottoman Empire in 1918, and the establishment of the British Mandate over Palestine by the League of Nations in 1922, the Zionist movement entered a new phase of activity. Its priorities were the escalation of Jewish settlement in Palestine, the building of the institutional foundations of a Jewish state, raising funds for these purposes, and persuading — or forcing — the British authorities not to take any steps which would lead to Palestine moving towards independence as an Arab-majority state. The 1920s did see a steady growth in the Jewish population and the construction of state-like Jewish institutions, but also saw the emergence of Palestinian Arab nationalism and growing resistance to Jewish immigration. International Jewish opinion remained divided on the merits of the Zionist project. While many Jews in Europe and the United States argued that a Jewish homeland was not needed because Jews were able to live in the democratic countries of the West as equal citizens, others supported Zionism. Albert Einstein was one of the prominent supporters of Zionism, and was active in the establishment of the Hebrew University of Jerusalem, which published in 1930 a volume titled About Zionism: Speeches and Lectures by Professor Albert Einstein, and to which Einstein bequeathed his papers. However, he opposed nationalism and expressed skepticism about whether a Jewish nation-state was the best solution. He said: "I am afraid of the inner damage Judaism will sustain, especially from the development of a narrow nationalism within our own ranks." Many Jews who embraced socialism and proletarian internationalism opposed Zionism as a form of bourgeois nationalism. The General Jewish Labor Union (Bund), which represented socialist Jews in eastern Europe, was anti-Zionist. Some Jewish factions tried to blend Jewish Autonomism with Zionism, favoring Jewish self-rule in the diaspora until diaspora Jews make aliyah. The Communist parties, which attracted substantial Jewish support during the 1920s and 1930s, were even more vigorously internationalist and therefore anti-Zionist, if one defines Zionism as the advocacy of a Jewish homeland in Palestine. During this time the Soviet OZET/ Komzet actively promoted an alternative Jewish homeland — the Jewish Autonomous Oblast with its capital in Birobidzhan set up in the Russian Far East. At the other extreme, some American Jews went so far as to say that the United States was Zion, and the successful absorption of two million Jewish immigrants in the 30 years before World War I lent force to this argument. Some American Jewish socialists supported the Birobidzhan experiment, and a few even migrated there during the Great Depression. The rise to power of Adolf Hitler in Germany in 1933 produced a powerful new impetus for Zionism. Not only did it create a flood of Jewish refugees but it undermined the faith of Jews that they could live in security as minorities in non-Jewish societies. Jewish opinion began to shift in favour of Zionism, and pressure for more Jewish immigration to Palestine increased. But the more Jews settled in Palestine, the more aroused local Arab opinion became, and the more difficult the situation became in Palestine. In 1936 serious Arab rioting broke out, and in response the British authorities held the unsuccessful St. James Conference and issued the MacDonald White Paper of 1939, severely restricting further Jewish immigration. The Jewish community in Palestine responded by organising armed forces, based on smaller units developed to defend remote agricultural settlements. Two military movements were founded, the Labor-dominated Haganah and the Revisionist Irgun. The latter group did not hesitate to retaliate in military action against the Arab population. With the advent of World War II, both groups decided that defeating Hitler took priority over the fight against the British. However, attacks against British targets were recommenced in 1940 by a splinter group of the Irgun, later known as Lehi, and in 1944 by the Irgun itself. The revelation of the fate of six million European Jews murdered during the Holocaust had several consequences. Firstly, it left hundreds of thousands of Jewish refugees (or displaced persons) in camps in Europe, unable or unwilling to return to homes in countries which they felt had betrayed them to the Nazis. Not all of these refugees wanted to go to Palestine, and in fact many of them eventually went to other countries, but large numbers of them did, and they resorted to increasingly desperate measures to get there; over 250,000 were smuggled out of Europe by an organization called Berihah. "As we know, the aspirations of a considerable part of the Jewish people are linked with the problem of Palestine and of its future administration. This fact scarcely requires proof... During the last war, the Jewish people underwent exceptional sorrow and suffering... The United Nations cannot and must not regard this situation with indifference, since this would be incompatible with the high principles proclaimed in its Charter... The fact that no Western European State has been able to ensure the defence of the elementary rights of the Jewish people and to safeguard it against the violence of the fascist executioners explains the aspirations of the Jews to establish their own State. It would be unjust not to take this into consideration and to deny the right of the Jewish people to realize this aspiration." Thirdly, it swung world Jewish opinion almost unanimously behind the project of a Jewish state in Palestine, and within Palestine it led to a greater resolution to use force to achieve that objective. American Reform Judaism was among the elements of Jewish thought which changed their opinions about Zionism after the Holocaust. The proposition that Jews could live in peace and security in non-Jewish societies was certainly a difficult one to defend in 1945, although it is one of the ironies of Zionist history that in the decades since World War II anti-Semitism has greatly declined as a serious political force in most western countries, though it increased greatly in Middle Eastern countries. In 1947 Britain announced its intention to withdraw from Palestine, and on 29 November the United Nations General Assembly voted to partition Palestine into an Arab state and a Jewish state (with Jerusalem becoming an international enclave). The Jewish Agency accepted the plan, while the Arabs of Palestine and the neighboring countries rejected it and commenced to use force to abort the establishment on a Jewish state in the area allotted to it by the UN. Civil conflict between the Arabs and Jews in Palestine ensued immediately. On 14 May 1948 the leaders of the Jewish community in Palestine made a declaration of independence, and the state of Israel was established. This marked a major turning point in the Zionist movement, as its principal goal had now been accomplished. Many Zionist institutions were reshaped, and the three military movements combined to form the Israel Defence Forces. The 1967 war between Israel and the Arab states (the " Six-Day War") marked a major turning point in the history of Israel and of Zionism. Israeli forces captured the eastern half of Jerusalem, including the holiest of Jewish religious sites, the Western Wall of the ancient Temple. They also took over the remaining territories of pre-1948 Palestine, the West Bank (from Jordan) and the Gaza Strip (from Egypt). Religious Jews regarded the West Bank (ancient Judaea and Samaria) as an integral part of Eretz Israel, and within Israel voices of the political Right soon began to argue that these territories should be permanently retained. Zionist groups began to build Jewish settlements in the territories as a means of establishing "facts on the ground" that would make an Israeli withdrawal impossible. The faith of the Palestinians in the willingness and ability of the Arab states to defeat Israel and return Palestine to Arab rule was destroyed by the war, and the death of the most militant and popular Arab leader, Gamal Abdel Nasser of Egypt, in 1970 reinforced the belief of Palestinians that they had been abandoned. The PLO, created in 1964 after a proposal by Nasser at the first Arab Summit, took on new life as an autonomous movement led by Yasser Arafat, and soon turned to terrorism as its principal means of struggle. In 1975 the United Nations General Assembly Resolution 3379 was passed. It stated that "zionism is a form of racism and racial discrimination" The resolution 3379 was rescinded in 1991 by the Resolution 4686. This issue is discussed in length in the article on anti-Zionism. More than 50 years after the founding of the State of Israel, and after more than 80 years of Arab-Jewish conflict over Israel, the West Bank and the Gaza Strip, some groups have misgivings about current Israeli policies. The overwhelming majority of Jewish organizations and denominations are strongly pro-Zionist. Some liberal or socialist Jews, as well as some ultra-Orthodox Jewish communities (the most vocal and visible being Satmar Hasidim and the Neturei Karta group), oppose Zionism as a matter of religious belief. Well-known Jewish scholars and statesmen who have opposed Zionism include Bruno Kreisky, Hans Fromm, and Michael Selzer. In the United States, a small number of Jewish intellectuals such as Noam Chomsky and Norman Finkelstein oppose modern Zionism. Chomsky says he supports a Jewish homeland, but not a Jewish state, and claims that this view is consistent with the original meaning of Zionism. Many mainstream Orthodox groups, such as the Agudat Israel, have changed their positions since 1948 and have reached a modus vivendi with the State of Israel. Others have often assumed right-wing stances regarding important political questions such as the peace process. Among the important minority threads within Zionism is one that holds Israelis to be a new nationality, not merely the representatives of world Jewry. The "Canaanite" or "Hebrew Renaissance" movement led by poet Yonatan Ratosh in the 1930s and 1940s was built on this idea. A modern movement based partly on the same idea is known as post-Zionism. There is no agreement as to how this movement should be defined, nor even of who belongs to it, but the most common idea is that Israel should leave behind the concept of a "state of the Jewish people" and instead strive to be a state of all its citizens according to pluralistic democratic values. Many Israeli historians consider " Canaanism" or "Pan- Semitism" to be an aberration beyond the bounds of Zionism. Self-identified post-Zionists differ on many important details, such as the status of the Law of Return. Critics tend to associate post-Zionism with anti-Zionism or postmodernism, both of which claims are strenuously denied by proponents. Another opinion favors a binational state in which Arabs and Jews live together while enjoying some type of autonomy. Variants of this idea were proposed by Chaim Weizmann in the 1930s and by the Ichud (Unity) group in the 1940s, which included such prominent figures as Judah Magnes (first dean of The Hebrew University) and Martin Buber. With the emergence of Israel as a Jewish state with a small Arab minority, however, the movement died down, but it was revived after the 1967 war left Israel in control of a large Arab population. The idea is nevertheless supported by a few prominent intellectuals such as Noam Chomsky, the late Edward Said, Meron Benvenisti (since 2003), and Tony Judt. Opponents of a binational state argue that since Arabs, whose population growth rates are much higher than among Jews, would form the majority of the population in such a state, the Jewish character on which the state was founded would be lost and the Jewish population's existence threatened, as it was threatened under other Turkish and Arab regimes in the past. They also suggest that such a state is unlikely to remain a democracy for long, as many Arab countries today have either autocratic or theocratic governments. Critics of Zionism see the changes in demographic balance which created a Jewish state and displaced over 700,000 Arab refugees, and the methods employed along the way, as inevitable consequences of Zionism. Critics also point to current inequities between Jews and Arabs in Israel, similarly viewing them as attributable to Zionist beliefs and ideologies. Some consider this ethnic and cultural discrimination to be a form of racism. Napoleon suggested the establishment of a Jewish state in Palestine as early as of 1799. Throughout the entire 19th century, the return of the Jews to the Holy Land was widely supported by eminent figures as Queen Victoria, King Edward VII, John Adams, the second President of the United States, General Smuts of South Africa, President Masaryk of Czechoslovakia, British Prime Ministers Lloyd George and Arthur Balfour, President Woodrow Wilson, Benedetto Croce, Italian philosopher and historian, Henry Dunant, founder of the Red Cross and author of the Geneva Conventions, Fridtjof Nansen, Norwegian scientist and humanitarian. The French government through Minister M. Cambon formally committed itself to “the renaissance of the Jewish nationality in that Land from which the people of Israel were exiled so many centuries ago". Even in faraway China, Wang, Minister of Foreign Affairs, declared that "the Nationalist government is in full sympathy with the Jewish people in their desire to establish a country for themselves." In 1873, Shah Nasr-ed-Din met with British Jewish leaders, including Sir Moses Montefiore, during his journey to Europe. At that time, the Persian leader suggested that the Jews buy land and establish a state for the Jewish people. King Faisal I of Iraq supported the idea of Zionism and signed the Faisal-Weizmann Agreement in 1919. He wrote: "We Arabs, especially the educated among us, look with the deepest sympathy on the Zionist movement. Our delegation here in Paris is fully acquainted with the proposals submitted yesterday to the Zionist organization to the Peace Conference, and we regard them as moderate and proper." Both the League of Nations' 1922 Palestine Mandate and the 1947 UN Partition Plan endorsed the aim of Zionism. The latter was a rare instance of concurrence between the United States and the Soviet Union during the Cold War. Various political groups and parties in India have also expressed support for Zionism. This reflects the opinion of many sections of Indian society that are increasingly sympathetic to Israel. In addition to Jewish Zionism, there was always a small number of Christian Zionists that existed from the early days of the Zionist movement. According to Charles Merkley of Carleton University, Christian Zionism strengthened significantly after the 1967 Six-Day War, and many dispensationalist Christians, especially in the United States, now strongly support Zionism.